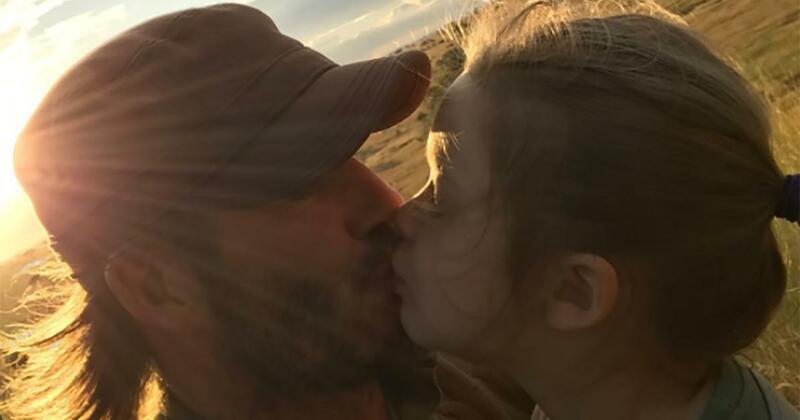 Soccer star David Beckham sparked a debate over the weekend after he posted a photo of himself kissing his daughter on the lips during a trip to Tanzania. The photo was posted on Thursday, along with the caption: "Kiss for Daddy" along with a heart emoji. But it sparked debate over the weekend, with many commenters sharing their disapproval of the photo. “David, to kiss lips of your daughter that's wrong,” one commenter wrote. However, others took to defend the star. "What's so special about this," a commenter wrote. "Just a beautiful father and daughter picture loving each other. Stupid people thinking otherwise." "Why is showing and expressing your unconditional love for your child so wrong? This picture of father and daughter is so naturally beautiful and pure. I feel sorry for you." Similar controversy occurred last year when Victoria Beckham shared a photo of herself kissing Harper on the lips. Do you think there's anything wrong with this? It's actually fairly common for some families to do this. In Europe it's actually quite normal for families to kiss on the lips, so it may actually come to a shock to some that there was actually as much fuss over the matter as there has been. People will get upset at just about anything these days.